1) A.O.C – The best brunch we had on our trip! This classic French Fare restaurant in the West Village was exactly what we were looking for. Guille had a veggie and cheese omelette with a side of potatoes + a side salad, and I had the Pain Perdu (French toast) with a side of fruits (+ a side of bacon by accident as we don’t eat meats). Everything was delicious! The décor was very French, they were playing some nice tunes, and I truly felt like I was eating in a little Parisian corner! J’ai adorée. 3) SEA – This Thai restaurant in Williamsburg has everything you need; great prices, tasty food, and a very fun/flashy décor. A few people recommended this place to us, and we liked it a lot! After spending our morning shopping at the Dumbo Flea Market and later riding the ferry to Williamsburg, SEA was a short five minute walk from the ferry drop-off. We ordered from the rad lunch special that included a complimentary appetizer with each main dish (#score!). Guille ordered veggie rolls as his appetizer and the fish bowl as his main (both delicious! ), and I got vegetable dumplings as my appetizer and the shrimp Pad Thai as my main. P.S. We also each got the coconut water, and it was freshness heaven! 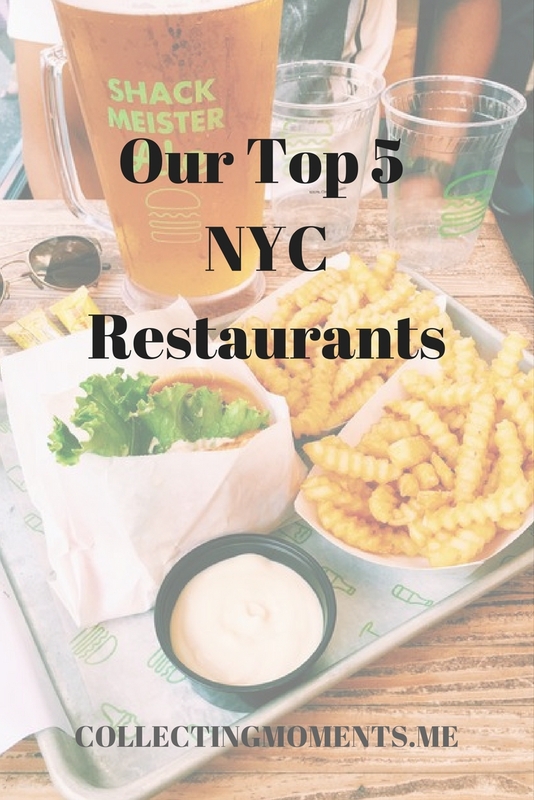 5) Shake Shack – This may be a fast-growing chain restaurant with numerous locations worldwide, but It originated in Madison Square Park and it’s based out of NY, so I’ll talk about its deliciousness in this post! Now, I LOVE and am OBSESSED with Shake Shack’s Shroom Burger and its cheese fries! In my opinion, you can’t get something as good, as fast, as cheap, and as conveniently located as going to Shake Shack. After walking all the way from The High Line to Central Park (+ a few stops along the way), grabbing some Shroom Burgers, cheese fries and a pint of beer at the Columbus Circle location, I’d never felt so good! Hope you liked my recommendations! Have you been to any of these places? Please let me know of any other places I MUST try on my next visit! In light of the holiday season upon us, I thought I’d share with you one of my greatest discoveries this past summer → Gwyneth Paltrow’s Travel App, G. Spotting! Eat, hangout, enjoy in Downtown Manhattan. Recap on my 5 top new restaurants I tried on my recent trip to NYC. All different vibes, different price range and equally delicous. Holistic Health Coach - What’s it about? (IIN) Holistic Health Coach Program - Follow my journey and tag along! WOW Air Review: Flying to Europe just got a lot Easier & Affordable. WOW Air Review - Want to enjoy the last couple of weeks of the summertime? Escape to Europe through WOW Air! Photo Diary of weekend spent in Amsterdam with our family. A Day at the Palace - Versailles Photo Diary. A day of Strolling through the Parisian Hills - Montmartre.